Ask any California health advocate what the major problem with Medi-Cal is and they will tell you, “It’s the low reimbursement rates to providers!” Indeed, for an average patient visit, Medi-Cal now reimburses doctors $41.48, while Medicare, the nation’s health program for the elderly, pays $102.45. A private provider will pay still higher, slanting physicians’ preferences for private insurance over public. The issue is starting to get hot. Earlier this month, thousands convened at the Capitol to push for higher reimbursement rates. Even Senate Republicans, according to the Senate Republican Caucus, called on governor to increase Medi-Cal rates for California’s most vulnerable citizens. When the kids groups had a conversation with DHCS, we found they were unwilling to even start the conversation about provider rates. Gov. Jerry Brown’s revised budget proposal put $125 million into rate increases for Medi-Cal managed-care health plans, but included nothing for providers. Now, under public pressure, Gov. Brown is calling a special session to address the financing of Medi-Cal. 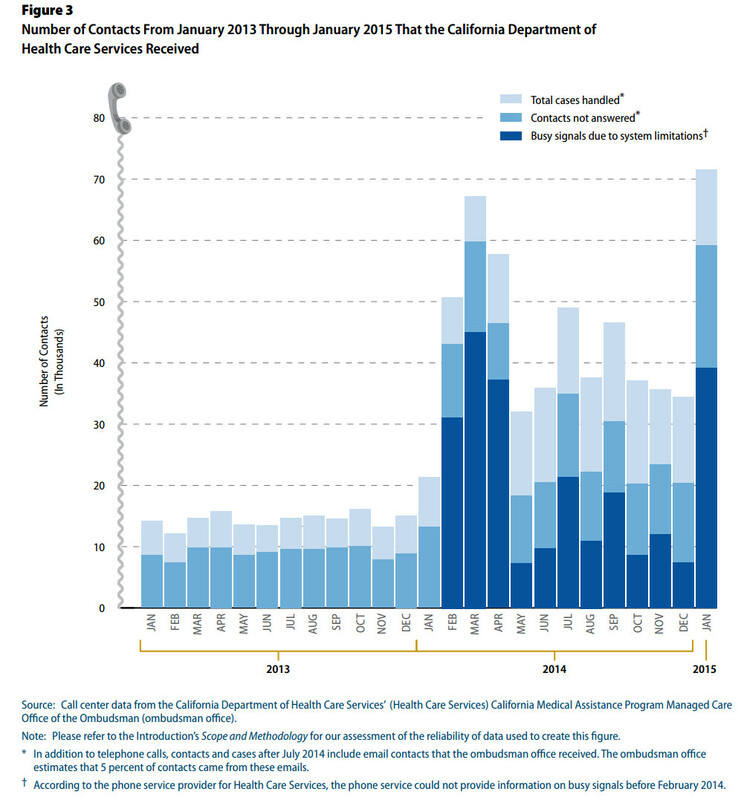 It seems that everyone is ready to have a big discussion about Medi-Cal reimbursement rates, except the most important government player, DHCS. Health Care Services did not verify health plan data; therefore, it cannot ensure that the health plans had adequate provider networks to serve Medi-Cal beneficiaries. In fact, even the provider listings from DHCS were fraught with errors. 23.4 percent of Anthem Blue Cross provider listings in Fresno County were inaccurate, including wrong phone numbers, addresses, practice type, etc. with the overall error rate for the entire directory at 6.6 percent. What’s more, the audit found that DHCS was unable to handle the vast majority of the phone calls it received from consumers from 2013 to the present, as shown in the graph below. Reading the audit report opened my eyes to the reality that we are asking the wrong questions. DHCS is not ready to have the conversation about increasing its provider reimbursement rates, because it doesn’t consistently know who its providers are. Neither is it able to deal with the influx of so many new Medi-Cal enrollees following the implementation of the Affordable Care Act. Since nearly one in three Californians is on Medi-Cal it is positively critical that we have functional systems in place to guarantee coverage that people can actually use. We should keep up the pressure on DHCS and the Governor, not just to increase Medi-Cal rates, but to do what it takes to process new enrollees, provide accurate provider information, and guarantee that health plans have adequate networks to serve Medi-Cal beneficiaries.